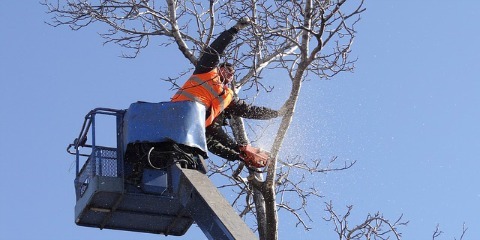 For the number one trusted tree care service in Missouri, customers turn to the tree experts at LakesTree Service. Serving residents of Stone County, Western Taney County, and South Western Christian County, Lakes Tree Service is the place customers turn to when trees located on their property line become an issue. If my neighbor’s tree branches fall into my yard, can I trim them? By law, if your neighbor’s trees or plants hang over into your yard you have the authority to cut them. However, the tree experts at Lakes Tree Service say that you only have the right to cut and trim trees up to the property line, not over into your neighbor’s yard. My neighbor owns a fruit tree, and the branches hang into my yard. Can I pick the fruit for myself? No, the fruit belongs to the owner of the tree. Even though branches may hang over into your yard, taking fruit from them is typically not permitted by law. My neighbor did major landscaping in his yard, and during the dig-up process, one of my trees died. Can I seek compensation from him for the dead tree? Yes, since your neighbor caused harm to a tree on your property you do have a legal right to sue for damages. If a limb from my neighbor’s tree causes damage, can I sue for the damages? This is left up to the court to decide. If a judge determines that your neighbor took good care of the tree and that the limb falling could not have been avoided even by their best efforts, they may not be considered liable. If, however, you can prove your neighbor did not properly care for the tree and did not responsibly cut hanging or dead branches, the court may find them partially or fully responsible. For more information on dealing with trees and plants that fall along property lines, call the tree experts at Lakes Tree Service at (417) 272-6013. For a complete list of their tree cutting and other services, to submit a request for an estimate or to read frequently asked questions, be sure to visit Lakes Tree Service online.